This topic possibly should be published long before when we talked about PaaS. New Users Often Seek Cloud Foundry Versus IBM BlueMix Comparison For Understanding the Tools, PaaS platform and Open Source Technology Behind. All possibly know that IBM Bluemix is a cloud platform as a service (PaaS) developed by IBM with integrated DevOps. Recently, IBM announced that they are merging the Bluemix brand with the IBM Cloud brand. Bluemix originally was based on Cloud Foundry open technology. Later IBM extended BlueMix with other cloud technologies including Apache OpenWhisk for providing Function as a Service (FaaS) or Serverless computing, OpenStack technologies etc and of course now Docker, Kubernates became an integrated part of development. At present, IBM BlueMix aka IBM Cloud is not exactly only PaaS of Cloud Foundry. Also the setup, tweaks will differ. It is possibly obvious to the reader that Cloud Foundry’s Open Source technology is a part of IBM Bluemix. Cloud Foundry can be installed as a single developer environment via BOSH Lite for testing. Supported platforms include OpenStack, VMWare vSphere, vCloud Director and vCloud Air. BOSH is an open source tool chain for release engineering, deployment and lifecycle management of large scale distributed services. BOSH installs and updates software packages on large numbers of VMs over many IaaS providers with the absolute minimum of configuration changes. You can see that, in the context of Cloud Foundry; IBM Cloud Foundry is the official name NOT IBM Bluemix. IBM Bluemix was originally based on Cloud Foundry’s technology. Later IBM improved, added many parts. Cloud Foundry has a CLI program called cf which is the primary tool to interact with Bluemix and also Bluemix provides a web GUI. Cloud Foundry introduced the concepts of Organizations that contain Spaces, Services and Applications. Different Spaces typically correspond to different lifecycle stages for an application. A Cloud Foundry service usually performs a particular function like running MySQL server and an application usually has services and their keys bound to it. OpenWhisk, on the other hand is a distributed event-driven compute model. OpenWhisk also has a CLI program called wsk which can be used to run code snippets, or actions. IBM Bluemix has local installation for the enterprises which obviously has mandatory lot of compliances to follow. This Article Has Been Shared 7437 Times! Questions Around Infrastructure, Platform Services And Cost Play A Decisive Role While Finding The Right Cloud Provider For Cloud Native App. Using Several Cloud Providers Helps To Get Perfect Solution With Increased Management Burden. Here Is Multi Cloud Management System In Brief. Can Cloud Check Ransomware Attacks? Can ‘Cloud’ Check Ransomware Attacks? Antivirus Like Softwares Are Designed to Block Attempts By Ransomware From Encrypting Data & Ask Money. 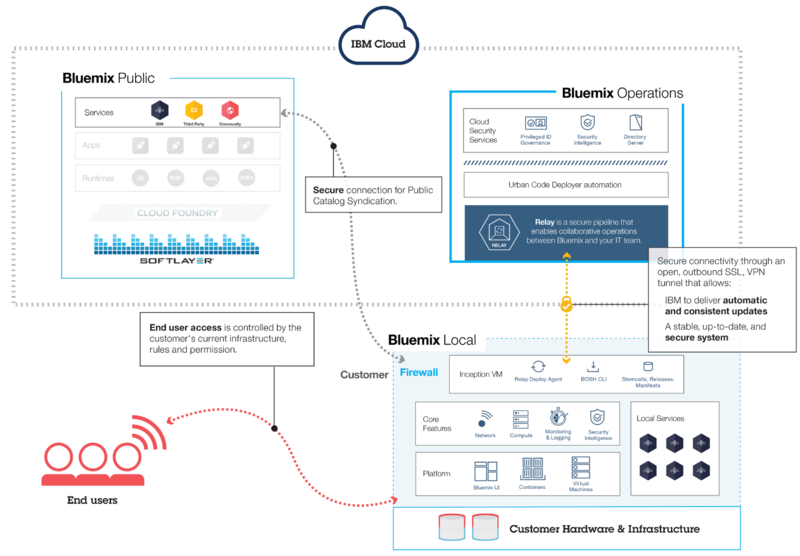 Cite this article as: Abhishek Ghosh, "Cloud Foundry Versus IBM BlueMix (IBM Cloud)," in The Customize Windows, January 3, 2018, April 21, 2019, https://thecustomizewindows.com/2018/01/cloud-foundry-versus-ibm-bluemix-ibm-cloud/.